Dry cleaning is not as “dry” as you might think. Find out what happens behind the scenes at your local dry cleaner. When you wash laundry at home or at the laundromat, you’re using water and soap as solvents to lift dirt and stains out of your clothes. But some types of fabric don’t mix well with water, like cashmere and wool. The solution to this problem came in 1855 when Jean Baptiste Jolly, a French dye-works owner, observed that his tablecloth became cleaner after his maid accidentally spilled a kerosene lamp on it. With that happy accident, “dry cleaning” was born. Dry cleaning is only “dry” in the sense that water is not used as the solvent. Instead, early dry cleaners used kerosene and gasoline to clean clothes and fabric, followed by carbon tetrachloride and trichloroethylene in later years. Nowadays, perchloroethylene (perc), a much safer and faster option, is the solvent of choice. Sorting and inspection – When you bring your clothes in, all dry cleaners use some sort of tagging process to help them keep track of your clothes, so they don’t get mixed with others. They will also inspect your clothes for any tears, missing buttons, and other pre-existing conditions. Stain treatment – Once your clothes are tagged and inspected, the dry cleaner will look for stains and will pre-treat them to make removal easier. Dry cleaning – After the stains have been pre-treated, your clothes are put into a dry cleaning machine where they are cleaned with perc. 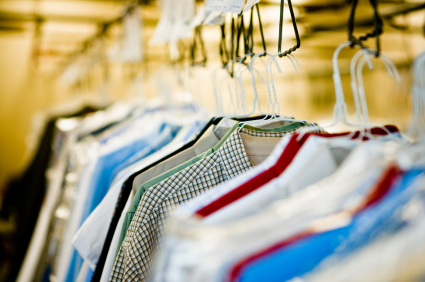 Post-spotting – If there are any remaining stains, the dry cleaner will use the appropriate chemicals, steam, air, and a vacuum to remove what’s left. Finishing – This last step includes pressing, folding, packaging, and other finishing touches. Looking for a dry cleaner in Essex County, New Jersey? NJ Laundromats’ Belleville laundromat offers full dry cleaning services plus a 20% discount if paid for in advance! Stop by and see us today.